In my world, summer generally means a visit to Grammy and Papa's rustic, woodsy Colorado cabin. While I love raising my kids in NYC, with all of the museums, parks and culture it has to offer, I also enjoy escaping from the urban jungle so we can explore the great outdoors. One fun and educational way to do that is the national Junior Rangers Program, which we discovered last summer in Colorado. My kids received different activity books—geared toward their respective ages—to read and complete with the promise that, once they were done, they could meet with a Park Ranger, discuss what they'd learned and be sworn in as Junior Rangers complete with badges. Although my children became Junior Rangers far from the Big Apple in Rocky Mountain National Park, NYC kids can do it at 10 sites right here in and around Manhattan. 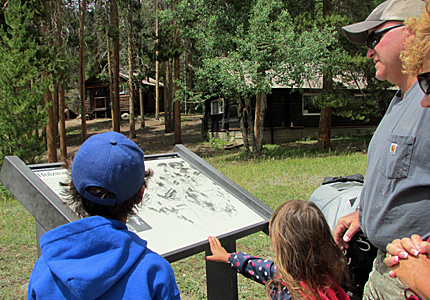 My kids got a kick out of visiting this historic site in Rocky Mountain National Park where their grandfather, at right, used to vacation as a kid. The Junior Rangers experience made such a big impression on my kids. I was awed at how much they learned through the interactive program, which has been around since 1960. New York City is home to 10 National Historic Sites, Monuments and Parks that offer this fun and FREE educational program. We only crossed one off our list last year, so we'll be collecting our badges as soon as school is out for the summer! Interested in joining us? Here are the sites. Perhaps the best known landmark in our area, the Statue of Liberty was erected in 1886. The cost of a ferry ride will get you to Liberty Island and grant you access to the outdoor grounds. If you want to visit the pedestal, museum or crown, a separate reservation is required. The Junior Ranger program here has a recommended age range of 7 to 12 years. You must download your booklet before you go. Your ferry ticket to the Statue of Liberty also gets you passage to Ellis Island. Kids should download a Junior Ranger book before heading out. The activities will guide them through the museum and the Island's history, and let them walk in the footsteps of the immigrants who passed through its doors. Castle Clinton was one of a series of forts built in New York Harbor as a defense system to fortify the city prior to the War of 1812. It's served many purposes since then, including acting as the first stop for millions of immigrants before Ellis Island was up and running. These days it's best known as the departure point for tourists heading out to visit the Statue of Liberty and Ellis Island. But, before you board, visit a Ranger to learn how your child can earn a badge! Our tour of Fort Jay took us to the ammunition lockers that rest underneath it. Though they haven't been used in decades, the smell of gunpowder was still evident. Our love for all Governors Island has to offer is well-documented. But our trip late last summer on a weekday (when it was much less crowded), made me love it even more. Earning Junior Ranger badges was the primary goal of our trip, and my three kids and I were able to attend Ranger-guided tours of the two major forts on the island: Castle Williams and Fort Jay. Our tour of Castle Williams even took us to the roof for a breathtaking view of the Lower Manhattan skyline. We also learned about the history of the building, which housed Civil War prisoners in deplorable conditions, while captured officers were treated to a much more comfortable stay at Fort Jay across the isle. The Park Rangers were attentive, answering question after question from my 9-year-old, who has a particular affinity for military history, and they walked my 5-year-old through drawing a fort design, one of the requirements for this badge. We had a lot of fun, learned some interesting facts and earned the Junior Ranger badges, plus the desire to return this summer for the full island Hike Through History tour. I definitely blew my kids' minds when I informed them that this site, in the shadow of the New York Stock Exchange, was the actual spot where George Washington was inaugurated. See the Bible that was used during the swearing in ceremony, plus galleries dedicated to the first POTUS, the Constitution and the federal government. Be sure to visit on a weekday since it's only open Monday to Friday. The Visitor Center is located within the Ted Weiss Federal Building, although the African Burial Ground National Monument itself sits outside along Duane Street between Broadway and Elk Streets. The site marks the first African-American cemetery where an estimated 15,000 people were buried during the 17th and 18th centuries. Junior Ranger booklets are available in the Visitor Center or can be downloaded before you go. 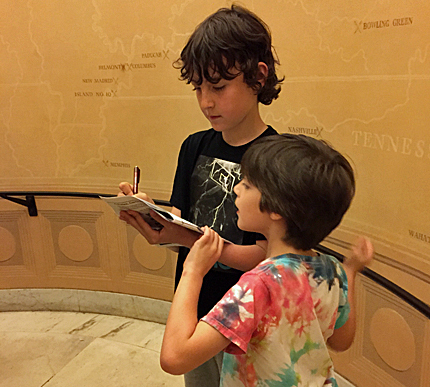 On a recent visit to Grant's Tomb, my kids' good friends worked together to earn their Junior Ranger badges. If you've ever asked, "Who is buried in Grant's Tomb?" then this is the trip for you. I'll give you a tip: The answer extends beyond the obvious. This monument sits atop a bluff in Riverside Park and paints a regal picture. The architecture of the mausoleum will make you feel like you're on the National Mall. Civil War-era memorabilia is also on display. Once your kids have earned their badges, head to the rear of the site where a collection of tile benches inspired by the work of architect Antoni Gaudí makes for a colorful photo op. Note: the memorial is only open Wednesday to Sunday. This spot is definitely next on our list of Junior Ranger adventures, as it's within walking distance of my apartment. 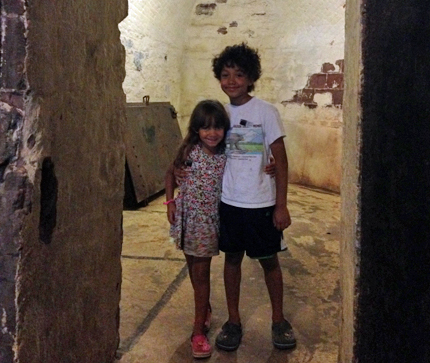 In fact, I'm embarrassed to say my children have yet to visit the site, which was the home of Alexander Hamilton. The house includes three restored period rooms, and an introductory video tells the story of George Washington's right-hand man. Though it's current location in St. Nicholas Park was part of Hamilton's original estate, the house itself has been moved twice! Open year-round, Hamilton Grange only welcomes visitors Wednesday through Sunday. St. Paul's Church is technically cheating as it's located in Westchester, just outside city limits. However, it is accessible via public transportation. This Revolutionary War-era landmark has worn many hats over the years: church, cemetery, wartime hospital and more. Kids will learn about the important role it played in our history as they complete the Junior Ranger activities. The Gateway National Recreation Area, which includes areas surrounding Jamaica Bay in Queens, parts of Staten Island and Sandy Hook in New Jersey, offers three separate Junior Ranger programs, depending on where you visit. If your travels take you a bit further afield, Junior Ranger badges can also be earned at the Fire Island National Seashore off Long Island. The National Park System offers the program at many more locations nationwide and has a special Web Ranger program kids can do from home to learn more about the NPS and the lands it protects. For more cultural fun, check out our Museums Guide. This post originally published in May 2015.